Last week, a bunch of us greedy types were kindly invited by Google Places/Zagat to join Londonist on a street food crawl of Soho. Unfortunately, it coincided with a day in which the weather got all diluvian on us, but we ended up being very British about these things – because nothing stops a scoffer. Not even half a tarp’s worth of water landing on your head and the tent you’re under nearly being blown away. First stop, Pizza Pilgrims, who had kept their Berwick Street market pitch open late for us. 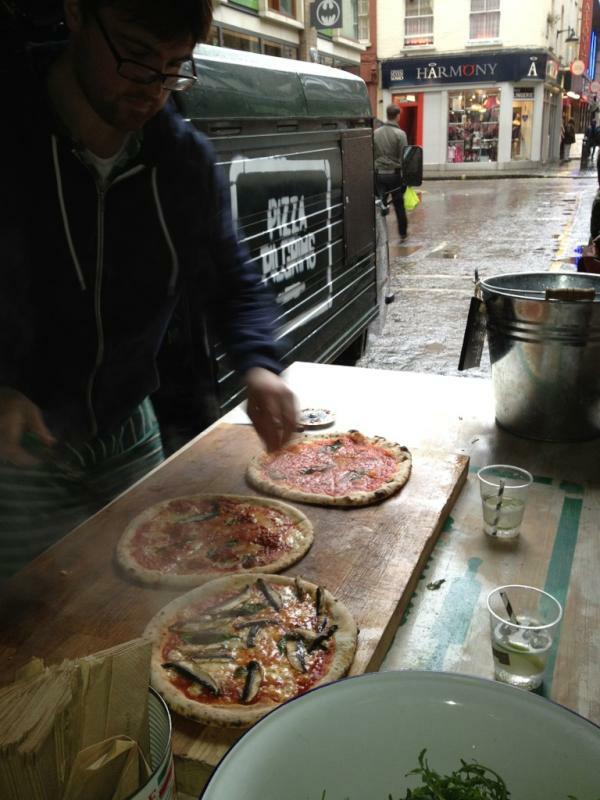 Only up and running for two months so far, the Napoli-style pizza stand has generated some well-deserved buzz already. The oven is built into the back of the van (apparently by some insane guy in Colchester – well you’d have to be) and the pizza that emerges shows off the top-notch ingredients going in – which is what pizza is all about. And for my lifetime of being looked at like I’ve grown a second head when I ask for a pizza without cheese (yes, I know – you can throw the stones later), the marinara is genuinely on the menu. For someone living their life working 12+ hours a day in media, it’s great to see the guys behind Pizza Pilgrims living the dream and turning a food obsession into a business. If you’re ever around Soho for lunch, make a beeline for them before everyone else finds out. And ask them to make the nutella pizza (nutella, mascarpone and basil, sandwiched between two pizza bases. Amazing). All this was accompanied by g&ts from the Travelling Gin Company, another recent venture from another couple of Nice Guys. 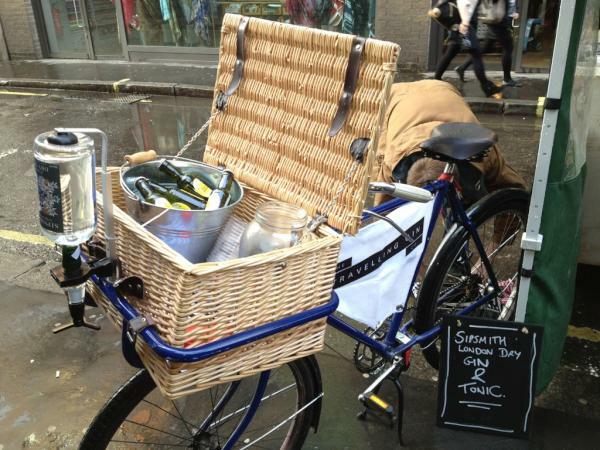 Delicious Sipsmith gin served from a bike basket with some fantastic straws. We never thought we’d get so excited about straws. The food was great all-round and the service polite and generous. The chicken livers with pomegranate molasses were a real highlight, along with the soujouc (sausages with tomato, parsley and lemon juice). 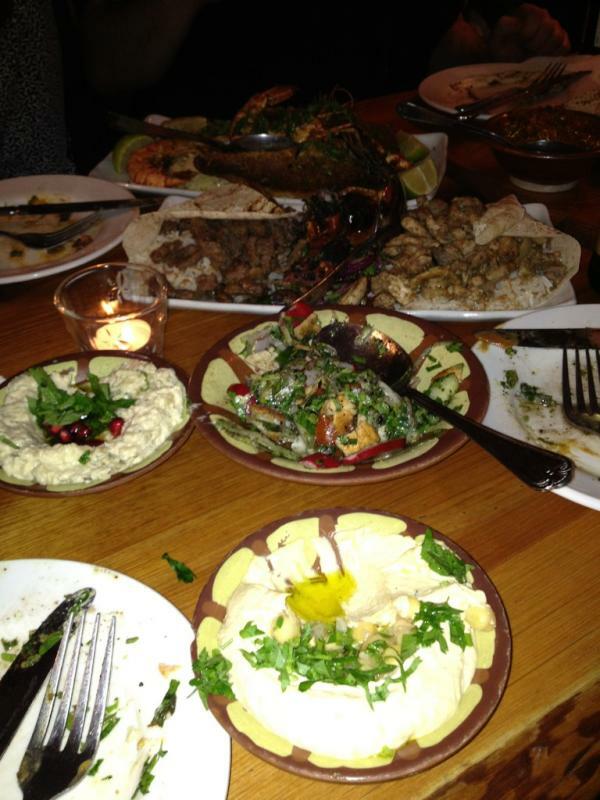 Each dish that we had, from stewed meats to fattoush to the charcoal grilled fish, chicken and lamb, was zesty and fresh. The advertising and branding for the place makes it look more slick and ‘Wahaca’ when the reality is actually a lot more pleasing – cosy, friendly and homely. I’ll definitely be heading back. Stuffed to the gills (and bearing boxes of food for lunch the next day), we headed to Snog. I’m a bit over ambitious when it comes to fro-yo – I’d much rather it just tasted like ice cream, but without all the fat. Just like I’d like Quorn to taste like prime rib, obviously. I like the Snog concept, but my “matcha flavour” pot had little matcha flavour under the sour yogurt taste – a shame, considering it’s great to have the options of anko and mochi. I’ll just wait for Gelupo, I guess. One of the piggiest nights of my recent life – thanks very much to Google for treating us!